CALL FOR EXTENDED ABSTRACT for IEEE IPIARTI 2019,23 June 2019, Universiti Tun Hussein Onn Malaysia (UTHM), Batu Pahat, Johor, Malaysia. 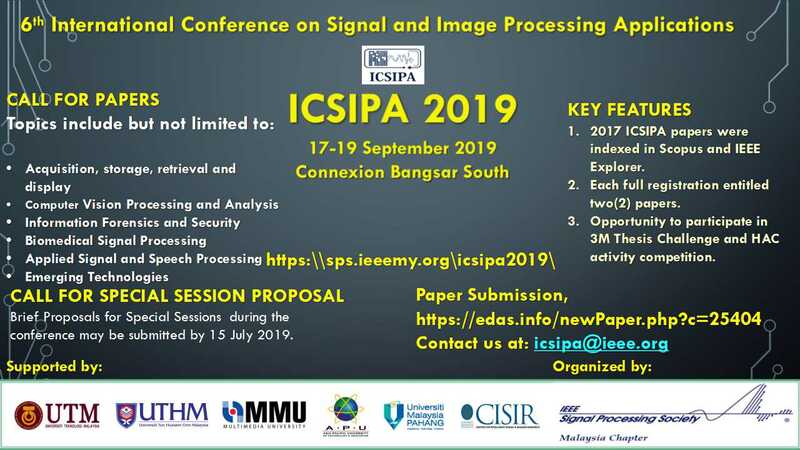 IEEE Signal Processing Society Malaysia Chapter is jointly organizing the 10th Symposium on Image Processing, Image Analysis and Real-Time Imaging (IPIARTI 2019) with the IEEE UTHM Student Branch. This FREE annual event, open to all members and non-members of the IEEE. It is organized with the objectives of bringing the university and industry community together to share and discuss the latest trends in image processing, analysis and real-time implementation, and to promote the IEEE Signal Processing Society Malaysia Chapter to the academic and industry community in Malaysia as a forum for professional networking and advancement. For further inquiry, please do not hesitate to email us at ipiarti.ieeesps@gmail.com. See you at this knowledge sharing event !